Places of interest: Foresteria San Benedetto, Campo Pianelli, Refuge of the Pietra, Sanctuary ed Hermitage Pietra di Bismantova Virgin Mary. Places of interest: Casale, Foresteria San Benedetto, Refuge of the Pietra, Sanctuary ed Hermitage Pietra di Bismantova Virgin Mary. Places of interest: Refuge of the Pietra, Sanctuary ed Hermitage Pietra di Bismantova Virgin Mary, Casale. The route takes about two hours overall on foot. It is in circular shape of about 5 Km up to the top of the Pietra di Bismantova then descending again down to the point of departure. The departure point is Piazzale Dante Square. Just below the departure point on the left, a footpath leads to the nearby guest quarters of the Monastery of Bismantova. Once past the building, continue northwards along an easy mule track that descends in a sunken path, snaking its way through woods and fields. At this point you come across one of the most enchanting stretches of the entire route: the path is dominated by the imposing east side of the Pietra di Bismantova. The route keeps descending through little reforested areas, after walking for about ten minutes (beware of the forks and make sure you follow the path’s white/red signs), you come out into a clearing where, if you keep to the right, along the side of a vast rocky landslide that, from the north-west corner of the Pietra, drops down to Casale. From the great landslide the path turns left and begins to rise along the edge of abandoned fields, finally arriving at the old cemetery of Campo Pianelli. Passing around the lower part of the graveyard and turning westwards, you follow a short level stretch after which you begin to climb through the wood. Following an easy cart track, making sure you follow the trail markers and avoid the paths branching off to the side, you climb until you reach a tableland where a rural building lies made of dry stone walls using local sandstone. Once past the building, you come to a fork where, if you turn left, you start to climb steeply towards the top of the mountain. The path, still following the wide cart track, enters a wood and, after a few minutes, you come to a stretch of bare rock, bearing clear signs of modifications for defensive purposes; this probably was the old access to the top of the Pietra di Bismantova that was kept under surveillance. If you go up for a further ten minutes, you finally come out on the plateau at the top. Keeping to the clearings southwards and, immediately after, westwards, you approach the edge of the great eastern side of the Pietra: once there, you follow it southwards until you come to the end at the fence that protects the Piazzale dell’Eremo Square (Monastery) below. Still following the eastern edge of the wall, you come to the south east corner of the mountain. The route then leaves the edge of the “Pietra”, first turning towards the west and then heading north until it reaches the point of arrival of the main path on which you can soon find you way back to the Monastery. The periplus, or circumnavigation, of the Pietra di Bismantova is a route that you can follow on foot, by bicycle or even by car in order to enjoy the wonderful panorama it offers. It is about 15 Km long, and starts off from the centre of Castelnovo. The route gives you the opportunity to see the Pietra from all sides, thus enjoying all the different aspects of its morphology. The wide path that follows an oval shaped route enables you to visit very interesting rural hamlets and villages such as Carnola, Vologno, Maro, Casale and Campolungo: from each of these boroughs there easy access to footpaths leading to the peek is available. The entire route by road that we suggest can be extended by descending into the Pianello area, where the brook Dorgola flows into the River Secchia, in a natural area rich in caves, minerals, and flora and fauna, a destination for both scholars and enthusiasts. It is the area of Triassic Chalks, where some hills rise up to a height of 900 mt, made of anhydritic formations that originated about 200 million years ago. Mount Rosso, mount Merlo, Mount Carù and Mount La Pianellina form an outcrop that is more or less unique in northern Italy and home to a large number of protected botanical species. The Pietra di Bismantova is a site particularly renowned in the sporting / hiking community due to two hiking routes: these are known as Ferrata degli Alpini and the more recent Ferrata dell’Ultimo Sole. The Ferrata degli Alpini, inaugurated on 20 June 1970, was created by a group called the Friends of Bismantova. It starts from CAI – Italian Alpine Club path n° 699 that climbs to the highest part of the eastern wall. The Via Ferrata is uninterrupted, mainly vertical with very exposed stretches, and calls for full equipment (sling, dissipator and helmet). The Ferrata path is divided into two very distinct parts: one that follows the side of the south-east side and has some non-ferrata stretches; the other that goes over the side, is fairly difficult due to both the physical effort it demands and its exposure. The start of the Ferrata is reached by passing along below the Monastery, from which you climb up to the foot of the Pilone Giallo and, through a distinctive underpass, you reach a large grassy ledge below the south east side. Following it along an easy path, after a short descent, you arrive at the base of the first equipped face. In January 2017, the Ferrata dell’Ultimo Sole was opened; this was completed on the prior winter by the mountaineering guides association Guide Alpine della Pietra and by CAI Bismantova di Castelnovo ne’ Monti. 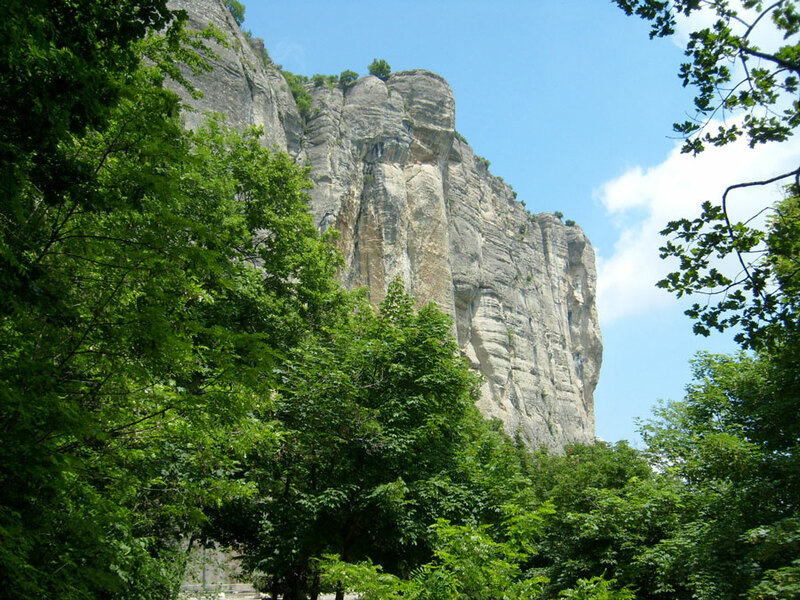 This hiking routes winds along the West side of the Pietra di Bismantova. From Piazzale Dante one follows the footpath leading to the plateau on the peek up to the start of the last stony ramp. At this point, an arrow signs points to the start of a descending footpath to the left, within two minutes’ walk, leading to the West side, where metal cables begin to appear. An excellent excursion to familiarise oneself with this type of hiking routes, this should be approached with adequate equipment and safety measures. 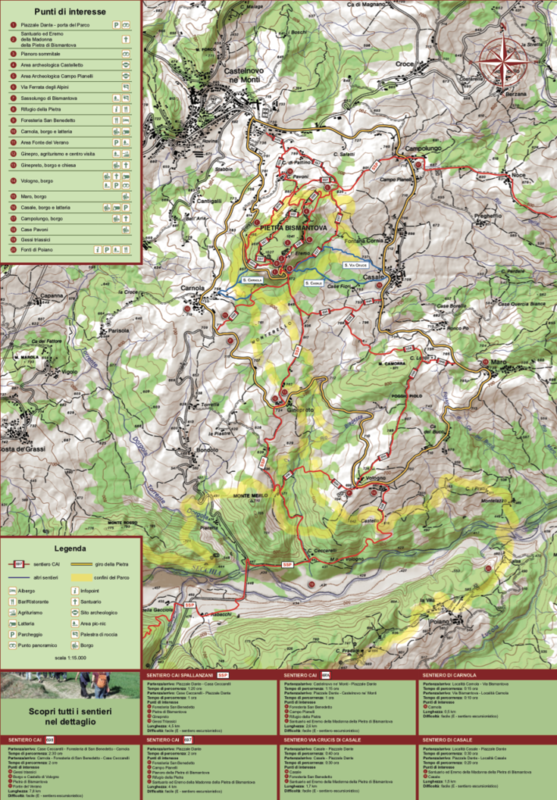 For information on these two hiking routes, you can contact the CAI Bismantova on 0522 811939 (on Fridays between 20.30 and 22.00) or the mountaineering association Guide Alpine La Pietra on 347 2791710 or 349 8610283. Form Piazzale Dante Square, starting from the paths below the Foresteria San Benedetto, also a short yet charming route starts, that is fairly level, and that in about 20 minutes walk leads to the beautiful and scenic hamlet of Ginepreto, where you will find a charming church from the Thirteenth Century and will be able to enjoy a wonderful panoramic view. This path, and part of path n° 697 following the periplus across the slopes of Bismantova, also forms part of the well-known “Sentiero Spallanzani” (Spallanzani path), a route that runs, in seven stages, from Ventoso di Scandiano to San Pellegrini in Alpe, crossing a wide section of the Reggio Emilia Apennines. For further information on this route, you can take a look at the CAI _ Italian Alpine Club of Scandiano website (www.caiscandiano.it/pagina5.htm). Places of interest: Triassic Chalk Formations, Borgo and Castello di Vologno, Pietra di Bismantova, Verano Water Springs. Places of interest: Foresteria San Benedetto, Pietra di Bismantova, Ginepreto, Triassic Chalk Formations. Places of interest: Foresteria San Benedetto, Campo Pianelli, Pianoro della Pietra di Bismantova, Refuge of the Pietra, Sanctuary ed Hermitage Pietra di Bismantova Virgin Mary. Discover Castelnovo ne’ Monti with this app: what to see, where to stay, where to eat and shop.